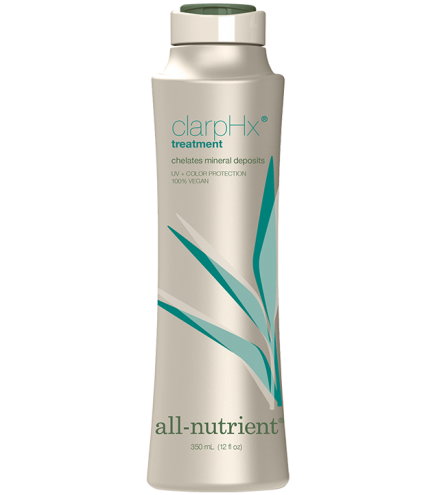 ClarpHx® Treatment is a gentle conditioning treatment containing a unique, sarcosine amino acid that acts as a chelating agent to remove harsh minerals such as iron, calcium, copper, and manganese deposited by hard water. It further purifies pool chemicals, medications, and residue build-up. Aloe Vera's natural enzymes help rejuvenate the hair and restore the pH balance of the scalp, while stimulating the production of moisturizing lipids. This entire system clarifies the hair while nourishing each strand, leaving it healthy and shiny. Apply uniformly to damp, clean hair. Wait 3-5 minutes and rinse hair with warm water. For excessive mineral build-up, repeat application.